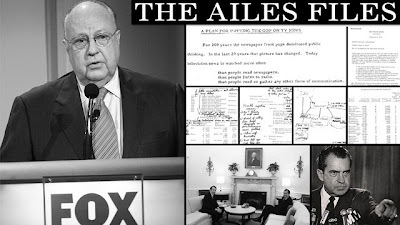 Criminalize Conservatism: The Secret Founding of Fox "News"
The Secret Founding of Fox "News"
"Republican media strategist Roger Ailes launched Fox News Channel in 1996, ostensibly as a 'fair and balanced' counterpoint to what he regarded as the liberal establishment media. But according to a remarkable document buried deep within the Richard Nixon Presidential Library, the intellectual forerunner for Fox News was a nakedly partisan 1970 plot by Ailes and other Nixon aides to circumvent the 'prejudices of network news' and deliver 'pro-administration' stories to heartland television viewers. "The documents—drawn mostly from the papers of Nixon chief of staff and felon H.R. Haldeman and Bush chief of staff John Sununu—reveal Ailes to be a tireless television producer and joyful propagandist. He was a forceful advocate for the power of television to shape the political narrative, and he reveled in the minutiae constructing political spectacles—stage-managing, for instance, the lighting of the White House Christmas tree with painstaking care. He frequently floated ideas for creating staged events and strategies for manipulating the mainstream media into favorable coverage, and used his contacts at the networks to sniff out the emergence of threatening narratives and offer advice on how to snuff them out—warning Bush, for example, to lay off the golf as war in the Middle East approached because journalists were starting to talk. 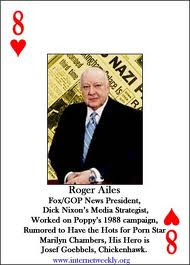 There are also occasional references to dirty political tricks, as well as some positions that seem at odds with the Tea Party politics of present-day Fox News: Ailes supported government regulation of political campaign ads on television, including strict limits on spending. He also advised Nixon to address high school students, a move that caused his network to shriek about "indoctrination" when Obama did it more than 30 years later." "'A Plan for Putting the GOP on TV News"' (read it here) is an unsigned, undated memo calling for a partisan, pro-GOP news operation to be potentially paid for and run out of the White House. Aimed at sidelining the "censorship" of the liberal mainstream media and delivering prepackaged pro-Nixon news to local television stations, it reads today like a detailed precis for a Fox News prototype. From context provided by other memos, it's apparent that the plan was hatched during the summer of 1970. And though it's not clear who wrote it, the copy provided by the Nixon Library literally has Ailes' handwriting all over it—it appears he was routed the memo by Haldeman and wrote back his enthusiastic endorsement, refinements, and a request to run the project in the margins. "Today television news is watched more often than people read newspapers, than people listen to the radio, than people read or gather any other form of communication. The reason: People are lazy. With television you just sit—watch—listen. The thinking is done for you. "This is a plan that places news of importance to localities (Senators and representatives are newsmakers of importance to their localities) on local television news programs while it is still news. 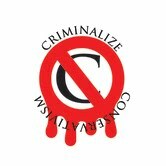 It avoids the censorship, the priorities, and the prejudices of network news selectors and disseminators. "This was before satellite, so the idea was that this GOP news outlet would record an interview with a Republican lawmaker in the morning, rush the tape to National Airport via truck, where it is edited into a package en route, and flown to the lawmaker's district in time to make the local news. Local stations, the writer surmised, would be happy to take the free programming. The plan is spectacularly detailed—it was no idle pipe dream. The writer estimated that it would cost $310,000 to launch and slightly less than that to run each year, sketched out a 9 a.m. to 6 p.m. schedule with shooting times, editing times, flight times, and arrival times, and estimated that the editing truck—"Ford, GMC, or IHS chassis; V8 engine; 5 speed transmission; air conditioning; Weight: 22,000GVW"—could be "build from chassis in 60 days." In other words, they were serious. 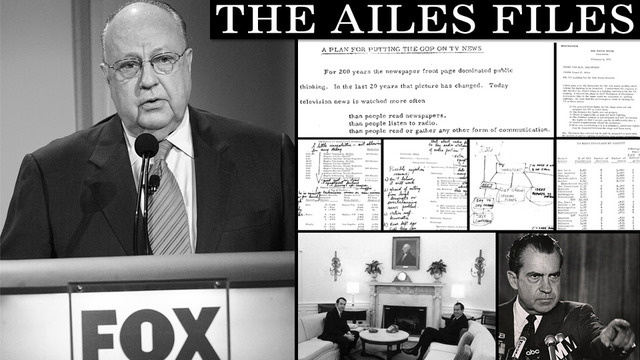 "Though it died in 1975, (Ailes first attempt,) TVN, was obviously an early trial run for the powerhouse Fox News would become. The ideas were the same—to route Republican-friendly stories around the gatekeepers at the network news divisions. In Nixon's day, the only way to do that was to pump stories directly to local stations. By 1996, cable television offered a much more powerful alternative. And the whole project began—on the taxpayer's dime—in the White House under the direction of a Watergate felon. One can only imagine how Fox News would report a similar scheme hatched in the Obama White House. One of Joseph Goebbel's Principles of Propaganda was "To be perceived, propaganda must evoke the interest of an audience and must be transmitted through an attention-getting communications medium." 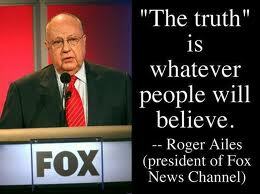 Roger Ailes and his Conservative cohorts were certainly familiar with this and other principles of demagoguery and propaganda, but this one seems most appropriate when considering the founding of Fox News. And it is quite unimaginable that other Principles of Progaganda would be unknown to the Conservative capos of the Republican Party. It's way past time to bring the so-called "news" network down, way past time to relegate it to the propaganda mill that it truly is.